I love getting to try out new pajama sets. Sleep should be a time of rest and comfort and wearing nice PJs is a big part of that. So trying new ones is always exciting, I'm looking for just the right ones that are comfortable and fit me great. Love+Grace has been that brand for me. They are so soft and comfortable that they are perfect for sleeping in. I received the Cassie Classic Print in Paisley in a Medium. The pants are definitely long, I'll probably hem them. These are the softest PJs I've ever tried. EVER! In my life! They are so amazingly soft. I can't wait for it to cool down enough so I can wear these. They are made from 50% Supima Cotton and 50% Modal which are both super soft. But the pants are long. I'm 5'6" so I'm not short. The good news is they will fit tall women, I'd say easily up to 5'10" in height! So those tall ladies, this is where to get your PJs!! I'll just hem them, no big deal! 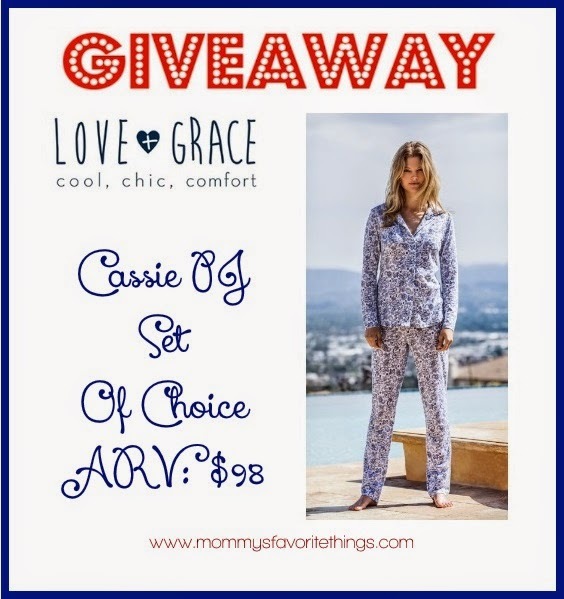 Love+Grace offers many other pajama sets and individual pieces. It's really a great material and you'd have to feel it to get what I'm saying!! Think your softest t-shirt times 2!! But one of you will get the chance to win a set for yourself so you WILL understand what I mean!! The Cassie comes in 4 prints and 5 solid colors!! Price: $98 but they are truly amazing! i like HI LO CHEMISE in addition to a lot of other items on this site. Those PJs look so comfy! I also like Bella in Ditsi Floral. In addition to the PJ's from the giveaway, I also like the sleeveless PJ top in Grey Heather! It would be perfect for these hot Florida summer nights! The Danielle nightshirt looks perfect for me! I also like the scalloped short with drawcord elastic waist. I like the HI LO CHEMISE! I really also liked the Bella. Very nice! I also like the Cassie Slub Jersey in mocha and the pants they show with it. The Bella is very pretty. They have a lot of nice stuff and the Jammies look so comfortable. These PJS Definitely sound like the softest ever. Even if they are longer, that's alot better than being short! Ha! Thankyou for the enjoyable, informative review.. I also like the Danielle Chemise in Blush. I really like Bella or Danielle! I like that the review talked about the length which is good for tall people. The fabric looks super soft and I love anything paisley which is one of the patterns. PJ's make me think of colder weather which is right around the corner. Today is the first day of Fall. I like the Danielle in blush! The PJs look good on you -- I would definitely have to hem them because I am 5'3"
I love the Flirty Long Sleeve Soft T-shirt. I would love to own a pair of these pajamas - they sound so so soft! I like the Emma PJ pant in Marlin color. I also like the Megan. I like the fluer de lis sweatshirt. These have everything I want in a cold weather PJ. Looks, comfort and quality. I just love 'em! I love the white Paulina pant! Cute and cozy! These are lovely pj's and I am in desperate need on new ones! I also love the Danielle chemise in mocha. I like the Paulina pant. I like the Flirty Long Sleeve Soft T-shirt and the scalloped shorts. Wonderful giveaway, thank you! Very nice review! They sound first quality and very comfortable. The pair you chose is perfect. I also like the Flirty Long Sleeve Soft T-shirt. I love the Paulina Pant and the Rose Peace Sweatshirt. Great giveaway! I also love the scalloped short. I also like the Paulina pants. Wow, they look so comfy and stylish!